If your web forms consist of small amount of content they render quickly in the browser and user can start working with them almost immediately. However, when your web forms are bulky and render too much of content, the page is loaded in the browser slowly. Users can start using the partially loaded page and perform actions such as clicking on links or buttons. At times this is undesirable and you want users to wait till the complete page is loaded in the browser. You can accomplish this with the help of little client side script. Let's see how. First of all, create a new ASP.NET web site and add a few controls on it. 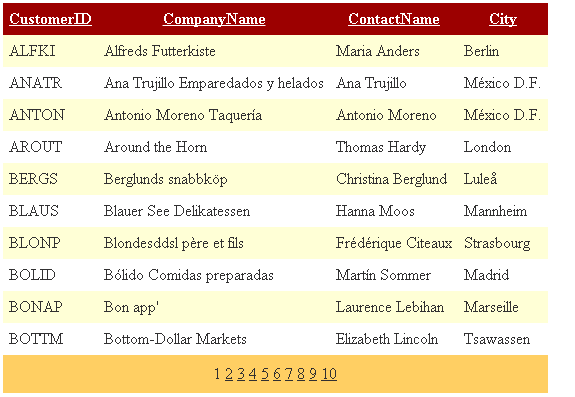 As an example, I am going to use a GridView that displays Customers table from the Northwind database. You will be using jQuery code in this example so ensure that you have referred the jQuery library in the web form. The <DIV> element has ID divContainer and it acts merely as a container to the GridView and SqlDataSource control. Here, the code uses jQuery append() method and appends the divMsg element to the body of the page. It then hides the divContainer element using hide() method. This way entire contents of divContainer i.e. GridView will be hidden from the end user and user will see only the wait message. The code inside the ready() event handler calls show() method on the divContainer so that the GridView is visible. It then removes divMsg using remove() method. The alert() at the beginning of the code is just for the sake of testing and you can remove if required. Notice how the GridView is yet to be displayed and how the wait message is displayed instead. Once you click on the OK button, GridView will be displayed and the wait message will disappear. If you do not wish to display any wait message you can call hide() and show() methods on body element directly. In this case divContainer is not necessary. Remember, however, that till the page is not loaded completely the end user will see a blank browser window.